I asked those questions to my group of sales people and they gave some really good answers. Fist, to really define persistence, it is the continuance of an effect after the cause is removed. When we get it in our mind that we are going to accomplish something, or be successful at something than over time what is it that we do to keep continuing the course? After that feeling, emotion, spark fades a bit or you encounter some obstacles, how do you have that continued effort to achieve your goals? I know it is easy to just say, “Oh foregt about it!” and move on to something else. Quitting is easy. Persistence is hard and painful. It can also be long and drawn out and very emotionally challenging at times. A life coach of mine used to say to me, “If success wasn’t hard, then everyone would be doing it!” I always get a chuckle when I remember that. 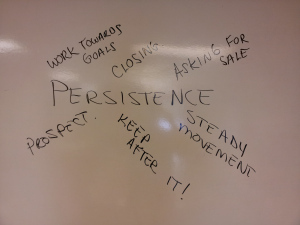 Ok, so what are some of the things that go into persistence? STEADY MOVEMENT: Always be working, moving towards your goal. Movement breeds activity and you never know when you might bump into someone, or an opportunity that will catapult you to your goals. Movement may be backwards (one step back might lend to two steps forward) but it is movement. A rolling stone gathers no moss. If you stop moving you will stagnate. (I don’t mean job jumping here, because you will never get established. ) What I mean by moving is being active. Doing. Learning. Practicing. Being pro-active rather than reactive. KEEP AFTER IT: This is a continuance of the above. Don’t see a setback as a negative thing. Many times obstacles and challenges are there for us to learn from and to get better. If you learn from your failures or mistakes, it may just help you in the future land that big deal, make that sale, or get that big break. No matter the challenges, always be learning and getting better. WORK TOWARDS GOALS: For starters, set goals. Small, big, sort-term, long-term and work towards them. If you keep them in mind and work towards them you will eventually accomplish them. In sales, set a goals for how many people you talk to, how many people you prospect, how many people you hand you business card to, how many people you present your product to, how many you ask to buy, and How many you close. Those are the main important goals to work towards. No matter what your dream and aspiration is you can set goals to work towards it and accomplish it. CLOSING: If you are in sales you must have the “A,B,C” of sales. Always, Be, Closing. If all you are doing is being a tour guide, or product information dump, then you won’t be successful. Always look for clues to where you can ask a closing question. ASKING FOR THE SALE: This also goes hand in hand with the previous one. Go for the sale and ask for it. First, build value in your produce and make sure you show the features and benefits. After that, you earned the right to ask for the sale. If they say no or give you an objection, don’t give up. Have persistence. Ask, “Why not?” or “What makes you say that?” and try to overcome the objection and ask for the sale again. Remember it is way too easy to give up. PROSPECT: Always be on the lookout for your next opportunity. Have your radar ears on. In sales, follow up with your customers and keep building those relationships, they will turn into referrals if you do. In everything else, make contacts. Talk to people. Network. You never know who you will run into that could help you reach your goals and dreams. The main thing about persistence is this . . . How bad do you want it? If you want success, accomplishment, or to reach your goals (and you want it bad) you will persist, no matter what, to reach it. You will crawl through broken glass to get it. You will have that burning desire and tenacity to get there. SO, HAVE PERSISTENCE AND YOU WILL REACH IT. Book Review - Gung Ho!